Can a Flat Tax Rescue Italy’s Economy? To put it mildly, Italy’s economy is moribund. There’s been almost no growth for the entire 21st century. Bad government policy deserves much of the blame. 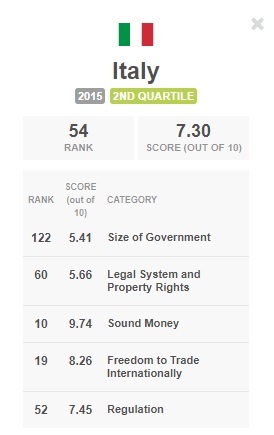 According to Economic Freedom of the World, Italy is ranked only 54th, the worst score in Western Europe other than Greece. The score for fiscal policy is abysmal and regulatory policy and rule of law are also problem areas. Moreover, thanks to decades of excessive government spending, the nation also has very high levels of public debt. Over the last few years, it has received official and unofficial bailouts from the International Monetary Fund and the European Central Bank, and Italy is considered at high risk for a budgetary meltdown when another recession occurs. And let’s not forget that the country faces a demographic death spiral. You don’t have to believe me (though you should). Others have reached similar conclusions. Here are excerpts from some VoxEU research. Italy will increasingly need to rely on growth fundamentals to sustain its public debt. Unfortunately, the fundamentals do not look good. Not only was Italy severely battered by Europe’s double dip recession (its GDP is lower today than it was in 2005) but when we look at the growth of labour productivity…, we can see that Italy has been stagnating since the mid-90s. …At the end of 2016, Italy’s central government debt was the third-largest in the world…, at $2.3 trillion. …a debt crisis in Italy could trigger a global financial catastrophe, and could very possibly lead to the disintegration of the Eurozone. To avoid such a scenario, Italy must revive growth…a tentative policy prescription is for Italy, to remove those institutional barriers (such as corruption, judicial inefficiency and government interference in the financial sector) that stifle merit and contribute to cronyism. Desmond Lachman of the American Enterprise Institute paints a grim picture. Italy’s economic performance since the Euro’s 1999 launch has been appalling. …an over-indebted Italian economy needs a coherent and reform-minded government to get the country quickly onto a higher economic growth path. …since 2000, German per capita income has increased by around 20 percent, that in Italy has actually declined by 5 percent. Talk about two lost economic decades for the country. …if Italy is to get itself onto a higher economic growth path, it has to find ways improve the country’s labor market productivity… It has to do so through major economic reforms, especially to its very rigid labor market…being the Eurozone’s third largest economy, Italy is simply too big to fail for the Euro to survive in its present form. However, it is also said that being roughly ten times the size of the Greek economy, a troubled Italian economy would be too big for Germany to save. Even the IMF thinks pro-market reforms are needed. Average Italians still earn less than two decades ago. Their take-home pay took a dip during the crisis and has still not yet caught up with the growth in key euro area countries. …a key question for policymakers is how to enhance incomes and productivity… In the decade before the global financial crisis, Italy’s spending grew faster than its income, in important part because of increases in pensions. …The tax burden is heavy…a package of high-quality measures on the spending and revenue side the country could balance the need to support growth on the one hand with the imperative of reducing debt on the other. Such a package includes…lower pension spending that is the second highest in the euro area; and lower tax rates on labor, and bringing more enterprises and persons into the tax net. …together with reforms of wage bargaining and others outlined above, can raise Italian incomes by over 10 percent, create jobs, improve competitiveness, and substantially lower public debt. There’s a chance, however, that all this bad news may pave the way for good news. There are elections in early March and Silvio Berlusconi, considered a potential frontrunner to be the next Prime Minister, has proposed a flat tax. Bloomberg has some of the details. A flat tax for all and 2 million new jobs are among the top priorities in the draft program of former premier Silvio Berlusconi’s Forza Italia party… The program aims to relaunch the euro region’s third-biggest economy… and recoup the ground lost in the double-dip, record-long recession of the 2008-2013 period. …Forza Italia’s plan doesn’t cite a level for the planned flat income tax for individuals, Berlusconi has said in recent television interviews it should be 23 percent or even below that. The written draft plan says a flat tax would also apply to companies. The program pursues the balanced budget of the Italian state and calls public debt below 100 percent of GDP a “feasible” goal. It is currently above 130 percent. Wow. As a matter of principle, I think a 23-percent rate is too high. But compared to Italy’s current tax regime, 23 percent will be like a Mediterranean version of Hong Kong. So can this happen? I’m not holding my breath. The budget numbers will be the biggest obstacle to tax reform. The official number crunchers, both inside the Italian government and at pro-tax bureaucracies such as the International Monetary Fund, will fret about the potential for revenue losses. In part, those concerns are overblown. The high tax rates of the current system have hindered economic vitality and helped to produce very high levels of evasion. If a simple, low-rate flat tax is adopted, two things will happen. There will be more revenue than expected because of better economic performance. There will be more revenue than expected because of a smaller underground economy. These things are especially likely in Italy, where dodging tax authorities is a national tradition. That being said, “more revenue than expected” is not the same as “more revenue.” The Laffer Curve simply says that good policy produced revenue feedback, not that tax cuts always pay for themselves (that only happens in rare circumstances). So if Italy wants tax reform, it will also need spending reform. As I noted when commenting on tax reform in Belgium, you can’t have a bloated public sector and a decent tax system. Fortunately, that shouldn’t be too difficult. I pointed out way back in 2011 that some modest fiscal restraint could quickly pay big dividends for the nation. But can a populist-minded Berlusconi (assuming he even wins) deliver? Based on his past record, I’m not optimistic. Though I’ll close on a hopeful note. Berlusconi and Trump are often linked because of their wealth, their celebrity, and their controversial lives. Well, I wasn’t overly optimistic that Trump was going to deliver on his proposal for a big reduction in the corporate tax rate. Yet it happened. Not quite the 15 percent rate he wanted, but 21 percent was a huge improvement. Could Berlusconi – notwithstanding previous failures to reform bad policies – also usher in a pro-growth tax code? To be honest, I have no idea. We don’t know if he is serious. And, even if his intentions are good, Italy’s parliamentary system is different for America’s separation-of-powers systems and his hands might be tied by partners in a coalition government. Though I’m encouraged by the fact that occasional bits of good policy are possible in that nation. …economic malaise is increasingly common across Italy, where unemployment tops 11 percent and the number of people living at or below the poverty line has nearly tripled since 2006, to 4.7 million last year, or almost 8 percent of the population… “Poverty will be center stage in the campaign,” says Giorgio Freddi, professor emeritus of political science at the University of Bologna. …Five Star is a fast-growing group fueled by anger at the old political class. …a €500 ($590) monthly subsidy to the disadvantaged…is a key plank in Five Star’s national platform, and the group’s leaders have promised to quickly implement such a program if they take power. Beppe Grillo, the former television comedian who co-founded the party, says fighting poverty should be a top priority. A basic income can “give people back their dignity,”… The Five Star program echoes universal basic income schemes being considered around the world. …Five Star says the plan would cost €17 billion a year, funded in part by…tax hikes on banks, insurance companies, and gambling. Ugh. Basic income is a very troubling idea. I’ve already speculated about whether Italy has “passed the point of no return.” If the Five Star Movement wins the election and makes government even bigger, I think I’ll have an answer to that question. Which helps to explain why I wrote that Sardinians should secede and become part of Switzerland (where a basic income scheme was overwhelmingly rejected). In conclusion, I suppose I should point out that a flat tax would be very beneficial for Italy’s economy, but other market-friendly reforms are just as important. P.S. Some people, such as Eduardo Porter in the New York Times, actually argue that the United States should be more like Italy. I’m not kidding. P.P.S. When asked about my favorite anecdote about Italian government, I’m torn. Was it when a supposedly technocratic government appointed the wrong man to a position that shouldn’t even exist? Or was it when a small town almost shut down because so many bureaucrats were arrested for fraud? Amazing that when situations get desperate like in Italy, even those on the left advocate for the kinds of policies that would have actually prevented this crisis in the first place! But under times of less duress, those same common sense fiscal and monetary policies are criticized as “trickle down” or other types of “Voodoo” economic policies; or they are criticized for favoring the wealthy, thus placing political pressure in order to maintain the status quo. With inverse taxation of wealth and income, low wealth families can choose to pay some wealth tax for reduction or elimination of income tax. The economy runs on families with savings. Berlusconi is a statist. He will not shrink collective spending, so any tax reform will mean little — especially for a country so far down the growth rankings. Yes, Italy passed the point of no return long time ago — especially considering the fact that the “neutral” characterization regarding a country’s future prosperity rankings should be given to countries that at least match average world growth, i.e. somewhere between 3-4% sustained annual growth. Any country below that level is on an arithmetically deterministic trajectory of decline — something that more or less characterizes every county in Europe — save a few ex Soviet colonies who are enjoying a temporary rebound from the dismally suppressed levels of communism. Italy’s shorter term future lies in some short term intra-nation redistribution within the European Union… as the whole continent — and its subpar growth — continue to fade away on the international scene, at an unprecedented rate on a historical time scale: from prosperity leaders to laggards in less than a century. Once the prosperity rankings of Europe decline even further, at some point, the slow growth cartel called The European Union will disintegrate — and that will be a good thing, as some of the more dynamic members will be partially freed to once again implement pro market reforms prosper, …or vote for someone like Corbyn and go down the path to Venezualization. Why will the EU disintegrate? Because what cannot go on will not go on — and with European long term trendline growth that is less than half the world average, nothing is sustainable — nothing! The only question is how long will Europe’s continental growth deficit have to compound before they cry Uncle. Not “if”,…but “when”. I like the flat tax, but it’s a political loser, unless the effective rates can be made progressive. It might be considered “fair” for everyone to pay the same rate, but politically unacceptable for someone making $10,000 to pay the same rate as someone making $1,000,000. A standard deduction is one option. A UBI is another. The difference is that a UBI can fix welfare as well as the tax code. Looked at from the employer’s point of view, a UBI is far preferable. Withholding is an easy X% tax times gross income. The employer can file taxes on behalf of their employees, cutting out a huge filing burden for most of the population. A standard deduction becomes much more complicated for employers, especially in a “gig” economy, where employees have multiple jobs.